Truck enthusiasts looking for power, handling and the ability to tow most anything have found the answer to their needs with the second-generation, 3.5-liter Ecoboost V-6 engine now available in the 2017 Ford F-150. 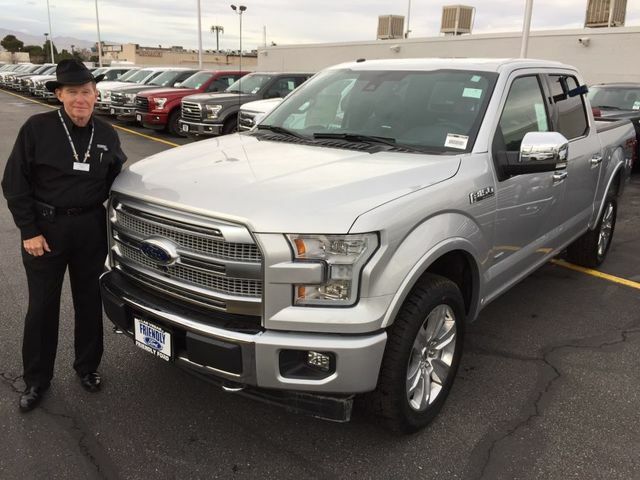 COURTESY Longtime Friendly Ford sales consultant Larry Davis is seen with a 2017 Ford 150 powered by the 3.5-liter Ecoboost V-6 engine. With 365 horsepower, the new powerplant provides 50 more pound-feet of torque compared with the first-generation EcoBoost engine. It has been rated best in class with 470 pound-feet of torque, beating all gasoline and diesel-powered competitors. Newly designed to provide better low-end and peak engine performance, the EcoBoost V-6 is being hailed for its ability to haul heavy payloads while towing heavy trailers. Longtime sales consultant Larry Davis said the new innovation Ecoboost engine is unbeatable. In addition, the transmission includes advanced material alloys that save weight. The F-150 has been Truck of the Year for the past 40 years, and the latest innovations seemingly have clinched the honor for many years to come. The all-new turbochargers deliver more boost and a lighter turbine wheel made of Mar-M-247 that was developed by the aerospace industry to save weight. In addition, the 3.5-liter Ecoboost has start-stop technology that optimizes fuel usage and can help lower CO2 emissions. Also, start-stop technology can shut off the engine when the vehicle comes to a complete stop, except when towing or when it is in four-wheel-drive mode. The F-150 also features a fully boxed frame with eight cross members made up of 78 percent high-strength steel, which is up from 23 percent in the previous generation. Situated at 660 N. Decatur Blvd., Friendly Ford opened in 1970. The dealership is an 18-time winner of the prestigious President’s Award, Ford’s highest single honor for customer satisfaction.